Channeling the works of Amartya Sen, we at Rice & Iron have often argued that the price of food and the people’s command over income matter far more than the country’s aggregate grain output. Therefore, indices such as wages and inflation constitute markers of great importance in assessing food security. If you are a regular follower of this blog, then you have seen the above graph posted many times before. The seismic waves of price volatility, unleashed by the currency revaluation in late 2009, caused such economic havoc that North Korea has yet to fully recover. One of the things we have tracked since that turmoil has been the consequences of “yuanization,” the adoption of Chinese renminbi (RMB) and other foreign currencies in market exchanges over the Korean People’s Won (KPW). While the use of RMB (or the US dollar) will allow many North Korean businesses to thrive without having to accommodate for the risk of monetary instability, the decreased circulation of KPW will inevitably lead to the currency’s decline in value and ultimately hurt the most vulnerable members of society. This is because Public Distribution System-dependents and others with limited market access will have fewer means to acquire foreign exchange, leaving them with only the high-risk sovereign tender. Once lost, restoring people’s confidence to a currency is a task that is difficult for even countries with robust financial services. 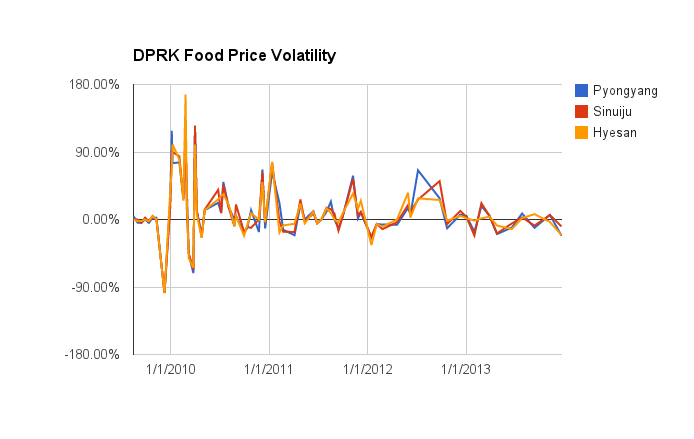 Nonetheless, it is one that we consider vital for North Korea’s long-term food/economic security. To be fair, the volatility has been steadily decreasing since 2010 and both rice prices and exchange rates appear to be stabilizing. Using rice prices and the exchange rate between the USD and the KPW for that same day, one can readily plot the changes in the dollar’s purchasing power in North Korea. As one might expect, the USD purchasing power shot up in the immediate aftermath of the 2009 currency revaluation and steadily fell over time until sometime in mid-2012. 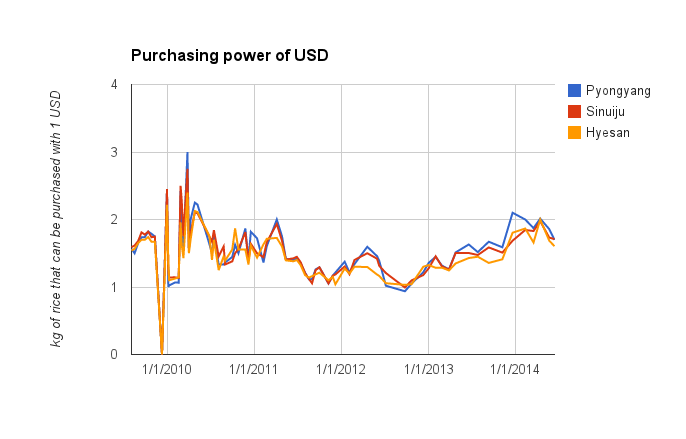 Then suddenly, the buying power of the dollar steadily increases until reaching levels unseen since early 2011. The rise in the USD purchasing power, no doubt fueling demand for foreign exchange for those who have the means to acquire it, is the direct result of diminishing price volatility – as rice becomes cheaper under more stable market conditions, more of it can be purchased with valuable foreign exchange. On April 15, 2004, rice prices in Pyongyang, Sinuiju, and Hyesan (3800 KPW, 3900 KPW, and 4000 KPW respectively) reached their lowest since June 8, 2012. Naturally, the purchasing power of the USD was inversely at its zenith with 1 USD capable of purchasing 2.01316 kg, 1.974359 kg, and 2 kg. What this meant was that a person who acquired 1 dollar around October 2012 could buy twice as many things with that same dollar in April 2014. So why would anyone hold their assets in KPW? Granted, rice should not be the only commodity considered, but it does represent the country’s most important consumer good and illustrates a key problem that must be addressed soon. For now, the purchasing power of the USD has dipped slightly since April. We will monitor where it goes. This entry was posted in Rice and tagged currency crisis, dollar, Exchange Rate, food price, KPW, price volatility, Public Distribution System, relative price, renminbi, yuanization. Bookmark the permalink.